Description: The 5-piece Mini-Snowmobile set includes a snowmobile that speeds along on realistically cleated track and skis, a detachable sled to follow behind the snowmobile, and three Original Little People figures: boy, girl, and a dog. The snowmobile seats two Little People figures whom bounce up and down as the snowmobile moves, and the sled seats only one figure. A couple of noteable variations exist among the pieces in this set. Both the snowmobile and sled have 2 plastic skis on the bottom. These skis can be either red or black (only red is shown in the Fisher-Price dealer catalogues), but the skis on the snowmobile and the skis on the sled should always match. This set always uses the same turquoise boy and girl. The dog pictured in the 1971 Fisher-Price catalogue has a red disc collar, but the dog pictured in 1972 and 1973 have a red collar with lines on the outside edges. 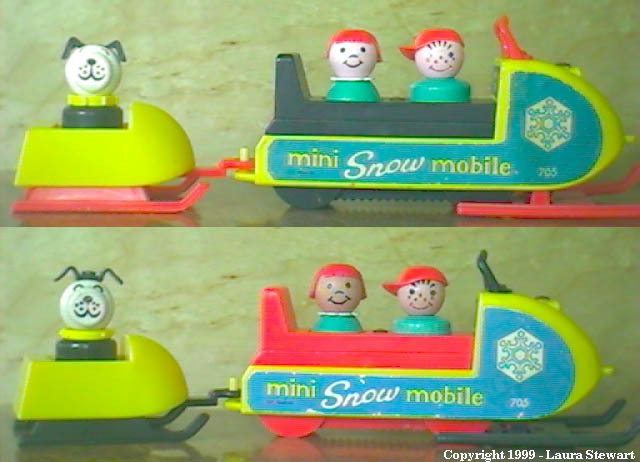 This is the only Original Little People "snow related" vehicle ever made. Several collectors think the snowmobile was designed to be used as an accessory vehicle for the #990 A-Frame, but the A-Frame wasn't introduced until 1974, a year after the snowmobile was discontinued. FPT601 - Yellow plastic snowmobile with realistically cleated track and 2 red skis on the bottom. The snowmobile has a black seat that seats 2 Little People figures. FPT603 - Yellow plastic snow sled with 2 red skis on the bottom. It has a red seat in the center (seats 1) and a red hitch on the front that connects to the peg on the back of the snowmobile. The ski color should match the snowmobile's skis. EFWW - Turquoise boy with a smiling face, freckles, "" eyebrows, and wearing a red sideways baseball cap. GSWW - Turquoise girl with a smiling face and red hair in a bob with bangs. HTWW - Regular base Lucky dog with a metal rivet between his ears, and wearing a red flat disc collar. EFWW or EFWP - Turquoise boy with a smiling face, freckles, "" eyebrows, and wearing a red sideways baseball cap. GSWW or GSWP - Turquoise girl with a smiling face and red hair in a bob with bangs. LDWW - Regular base Lucky dog with a metal rivet between his ears, and wearing a red collar with lines on the outside edges. FPT600 - The snowmobile also came with BLACK skis on the bottom, a black windshield on the top, and a red seat for two. FPT602 - The sled also came with BLACK skis on the bottom and a black hitch on the front. Other Information: This set was sold in a L-shaped 10-1/2" long, 2-1/2" wide, 3" high peggable blister pack.